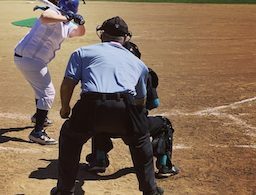 ESCONDIDO (3-13-16) — In Cougar Classic action at Kit Carson Park, the Santana Sultans took on Imperial and were able to despite four lead changes tame the Tigers 7-4. The first inning would see the Sultans put three runs on the board thanks to a couple of base hits and fundamental softball to lead 3-0. Leadoff hitter CASSIDY MATTHIE (1-2, R) singled, MACKENZIE BENNETT (3-3) singled, ERICA REID (3 R) came in as a courtesy runner, so with runners at first and second up came SYDNEY VATES (2-3, 2 R, RBI) who hit into a fielder’s choice as Matthie was thrown out at third. MADDY MENDEZ (R, RBI) drew a one-out walk which moved the runners up. RACHEL WILSON (2-2, 3 RBI) knocked in Reid on a sacrifice fly to right field for the second out, CELINE MENARD (1-3, RBI) knocked in Vates with her single and moved Mendez to third, than taking a gamble both Menard and Mendez pulled off a double steal and both were safe, Mendez stole home and Menard stole second base. LEXI CHAVARIN-MIRANDA popped up to end the inning but the damage had been done. Unfortunately the lead didn’t last for the Sultans as the Tigers were able to scrape four runs off of Sultan starter SOPHIA MARTORANA to take the 4-3 lead in the bottom of the second inning. Santana in the top of the third inning would plate a run to tie the score at 4-4. Bennett led off with a roped double, Vates singled moving Bennett to third and she would come in to score on a fielder’s choice by Mendez. After shutting down the Tigers in the bottom of the third to keep the score tied, the Sultan offense came alive in the top of the fourth inning. Leadoff batter BRITTANY MUNDAY flew out, Matthie with one down drew a walk, Bennett roped a double which moved Matthie over to third. Santana was in business as there were runners at second and third with Vates coming to the plate. She would lace a single that scored Matthie and move Reid who had come in as a courtesy runner for Bennett to third. The Santana faithful in attendance cheered loudly as the Sultans now owned a 5-4 lead. Mendez looked for more but struck out making it two down in the inning. The very next batter with two down and runners still in scoring position was Wilson who had singled in her previous at bat. She would work the count and than clobber a rocket of a shot deep into center field that scored both Reid and Vates, Wilson would end up with a triple. This sent the crowd into an even more of a frenzy as the score was now 7-4 in favor of the Sultans. Imperial finally got out of the inning but not before the serious damage had been done with two outs. Mendez for the Sultans continued her skills on the mound as she was able to get out of the inning after surrendering a one out double. The Sultans in the top of the fifth went down in order. The Tigers threatened in the bottom of the fifth as the first two batters got on thanks to a pair of singles. However Mendez had other ideas and was able to quash the threat and end the game thanks to a couple of popup outs. Mendez for the Sultans on the day in the victory tossed 3 1/3 innings in relief, gave up 0 runs on 4 hits while walking 1 and striking out 1. BRAWLEY 2, GROSSMONT 1 – The Grossmont Foothillers took on the Brawley Wildcats in a makeup contest in the Cougar Classic and unfortunately dropped a 2-1 heartbreaker. Both teams went back and forth for the first couple of innings without any budging one bit defensively. However that would change as the Foothillers would strike first in the top of the third inning as CHLOE CAMARERO (1-3, HR, RBI, R) blasted a leadoff jack over the left field fence to give Grossmont a 1-0 lead. The one run looked like it would hold up as CASSIDY DAVILA who took the circle for the Foothillers was tossing a gem of a game. Anything the Wildcats sent to the plate was retired and even when they got a hit or on base via a walk the threat was squashed. Grossmont unfortunately couldn’t take advantage and muster any type of offense either, despite putting runners on in multiple innings. The Wildcats in the bottom of the seventh and down to their last at bat were able to break through and score two runs thanks to multiple hits to get the victory. GROSSMONT 4, DEL NORTE 3 – The rain really wreaked havoc with the tournament schedule which forced many teams to play multiple games on the day, meaning many teams played an early contest and had to come back to play a semi-evening contest. The Foothillers were one of those teams. Grossmont who had dropped their first game in a close affair were able to bounce back in the second game against Del Norte in a come from behind 4-3 victory. The Nighthawks would strike the first blow in the game as they scored in the top of the third inning to take a 1-0 lead thanks to a single and a double. Del Norte would add another run in the top of the fourth on a solo homer to take the 2-0 lead. Grossmont would cut into the lead in the bottom of the fourth as SAMARIA ROOPES singled and KAILEY DANIELS came in as a courtesy runner, MEGAN MALWITZ singled and ALEXIS COLLINS singled giving Grossmont the bases loaded. KATIE APPENZELLER would knock in Daniels on a sacrifice fly to right field to make the score 2-1. That would be all the Foothillers would get as the next batter would be retired via groundout. In the bottom of the fifth, the Foothillers would tie the score as CHLOE CAMARERO (2-4, 2 R, 2B) would smash a double to center field, she would score on a 2 out clubbed double to left field by CARLY PEARSON (1-4, 2 RBI, 2B). Now with the score knotted at 2-2 the Foothillers were back in business. Both teams would go scoreless in the fifth and sixth innings. Del Norte in the top of the seventh was able to push across a run to take a 3-2 lead which they thought was sealed as they had deflated the Foothiller spirits. Leadoff hitter SHEA LANE singled and stole second base, the next batter grounded out for the first out, HALEY CRUSE proceeded to single to right field which scored Lane from second base. Grossmont was able to limit the damage to the one run as the next couple of batters were retired. Now trailing it looked like the Foothillers would drop another heartbreaker but not all was lost as with one down, Camarero ripped a single to center which brought cheers from the Hiller fans. The very next batter DESTINY BACON (1-4, RBI, R, 2B) who was hitless so far brought more joy as she blasted a double to left center that scored Camarero from first to tie the game at 3-3. She then proceeded to steal third base. Grossmont was back in the game and looked to win it. The next batter Pearson stepped to the plate and was down 1-2 in the count when she took the next pitch and was able to get enough of it to fly out deep enough for Bacon to tag up and score what was the game winning run and finish the great comeback. VALHALLA 5, EL CAMINO 1 – In Cougar Classic action the Valhalla Norsemen knocked off the El Camino Wildcats by the score of 5-1, Saturday (Mar. 12). Valhalla, despite having runners on in the first couple innings, couldn’t take advantage of their opportunities. This changed however as in the third inning the Norsemen pushed across three runs to take a 3-0 lead. BRANDY KOHEL (2-3, R) led things off with a single and RACHELLE SHELLSTROM (2-3, 2 RBI, R, 2B) ripped a double that scored Kohel, KENNEDY LABSHERE (2-3, RBI, R, 2B) followed suit as she smashed a double that scored Shellstrom and ALEXIS INGRASSIA (2-3, RBI, 2B) blasted the third double of the inning to score Labshere. Taking the circle for Valhalla was LILY METSCH (W, 5 inn, 0 runs) who in the top of the fourth retired the side in order. Valhalla would add another run in the bottom of the fourth thanks to a Shellstrom RBI double that scored JADE HILL to make it 4-0. They added their final run in the bottom of the fifth on a SAMMY GREEN groundout that scored GIANNA PAAPE. 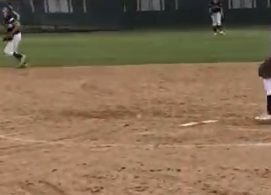 El Camino would finally get on the board as they were able to get to TORI BASSETTE who came in to relieve Metsch as they scored a run. It didn’t matter as Bassette was able to retire the next batter to get the save. 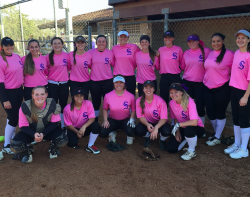 SAN MARCOS 5, VALHALLA 3 – Valhalla looked to win their second game of the day but unfortunately things didn’t go their way as the San Marcos Knights came back and took the 5-3 victory in Cougar Classic action. The Norsemen struck first in the first inning thanks to multiple base hits which led to two runs to make it 2-0 early on. Leadoff hitter BRANDY KOHEL singled, she would move to third on a double by KENNEDY LABSHERE (2-3, R, 2B), RACHELLE SHELLSTROM (1-2, RBI, SB) drove in Kohel on a sacrifice and SAMMY GREEN knocked in Labshere. San Marcos would finally get to LILY METSCH in the top of the third as the leadoff hitter singled, would move over on a sacrifice and would score when an error by Valhalla was committed in the inning to cut the lead to 2-1. They would tie the game in the top of the fourth thanks to a double and a single. Now with the score knotted at 2-2, the Norsemen went back to business in the bottom of the fourth as they pushed across a run to take the one run lead 3-2 on a double by CAMBRIA KEISER who would come around to score on an RBI single. Unfortunately the lead wouldn’t stick as the Knights got the bats going in the top of the sixth as they pounded out multiple hits and took advantage of a miscue to score three times to take the 5-3 lead which would hold up as Valhalla would be retired in order in the bottom of the inning. HELIX 10, YOUNGKERS (Ariz.) 0 (5 inn.) 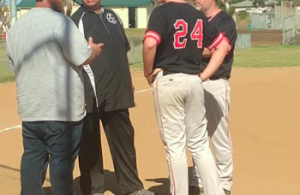 – The Helix Highlanders took on Youngkers out of Buckeye, Arizona in the final game of pool play of the Warhawk Classic and were able to get the run ruled 10-0 victory in 5 innings. The Highlanders welcomed an addition back to the team as BRIANNA REED who was on the Helix soccer team who were in the state playoffs made her season debut in the lineup. Her debut was successful as she went 3-4 and scored three runs. Things got rolling for the Highlanders when DESTINI BULLOCK blasted a 2-run blast over the centerfield fence. The dinger was her fourth homer of the season and gave the Highlanders the early 2-0 lead. Other offensive stars for Helix on the day were MCKENZIE FLORES who got a hold of one for her first homers of the season as she went 4-4 and also had a double and the freshman FAITH KING who had herself quite a day at the plate as well as she tallied 3-3 with three runs scored and also drove in 2 runs. TORREY PINES 10, GRANITE HILLS 2 – In Cougar Classic action the Granite Hills Eagles unfortunately ran into a juggernaut of a team in Torrey Pines who came away with the convincing 10-2 victory. The only runs for the Eagles came courtesy of a 2-run bomb in the bottom of the second inning by BRENDA RUSHING. Unfortunately that was all the runs they could muster as the Falcons pitching shut down the Eagle offense.